Two icons of mine died in the past couple of weeks, one I knew personally and worked with, and one who I had never met but who nevertheless intimately touched my soul. Although both were musicians, they had profound impacts on me as a writer. And both died in ways that honored who they were creatively. Lemmy Kilmister and I collaborated on his autobiography throughout the latter half of the 1990s. His band, Motörhead, had a significant amount of cult fame in the metal and hard rock communities, and while few outside of these music genres knew who he was in the U.S., he was a familiar face in the U.K., where he was from. I was a fan of both the band and the man. I’m a sucker for aggressive, unapologetic music and aggressive, unapologetic honesty — and that succinctly sums up Motörhead and Lemmy. At the time Lemmy and I were working on his book, loud music was not popular or fashionable. Grunge had steamrolled hard rock and nearly everybody wanted the goofiness of pop punk instead of the heaviness and power of metal. Bands like Lemmy’s were getting dropped from major labels left and right, getting demoted to smaller indie labels or splitting up altogether. But Motörhead persisted, continuing to make albums for whatever record label they could find, and touring for months on end without stop. This made it hard to get the book done — Lemmy was always busy, and when he wasn’t he needed time to relax at home and at the Rainbow Bar & Grill up the hill from his apartment. But as frustrating as it was at times to be stood up for a meeting, or having to wait months between interviews, I admired Lemmy for knowing who he was, having a vision, and sticking to it, no matter what. So many others in the same position compromised their identities in futile attempts to fit into whatever sound and look was currently in favor. Lemmy had no patience for such phoniness. He loved what he did, he was great at it, and he stuck to it. 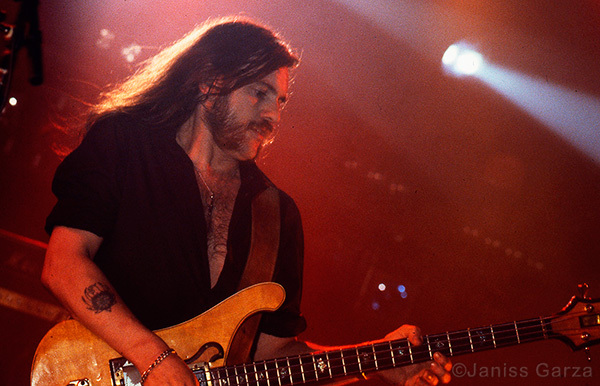 Lemmy’s musical approach was consistent, while David Bowie’s was constantly changing. But Bowie used his transitions to lead, not follow — he was a trendsetter, a commentator, and he was equally as uncompromising as Lemmy. I remember the first time I heard “Starman” as a kid. It was late at night on the radio, and I was sneaking a listen when I was supposed to be asleep… and it was so different from anything else I’d heard before, I was stunned. I didn’t know if I liked it or not — I didn’t know if I was supposed to like it or not! It wasn’t like anything on that era’s Top 40 AM radio, completely unlike the rock music I was learning to love, and as alien as the character the song was about. It changed my life (how many songs can you remember hearing for the first time? ), and the album it was on, The Rise and Fall of Ziggy Stardust and the Spiders From Mars, is still one of my top five favorite albums. Unlike Lemmy, you could never pin down Bowie musically. You had no idea what he was going to do on his next album. Usually you liked it, occasionally you didn’t, but whatever it was, it was unexpected and surprising. Bowie was eternally fascinating. As different as their approaches to music were, both Lemmy Kilmister and David Bowie were creative beings that were so completely in touch with themselves that they were able to sprinkle their magic over legions of loyal fans and make us feel it too. So magical they were, in fact, that none of us could ever imagine a world without either of them. And in the space of a couple of weeks, they were both gone. With his booze-and-speed lifestyle, Lemmy rode his body hard, and while he began to falter in the past couple of years, he continued to tour, and had plans for more shows when he was diagnosed with cancer. Lemmy would have hated suffering a slow, lingering death. He played music almost to the end and was always straightforward and brutally honest. When asked if he wanted to keep his illness a secret, he refused, believing that his fans deserved the truth. A press release about his cancer was being written when he died, two days after his diagnosis. David Bowie knew he had cancer for a year and a half, and he did something so typical of him as a talent: he consciously created his swan song, a good-bye to the world and his fans. In the album Blackstar and the video “Lazarus,” he reinvents himself for the last time, as a dying man. It’s as if he looked into death’s abyss and snatched back his power while he was losing his life. Bowie turned his own mortality into an artistic statement. Two days after the album’s release, he was dead. Instead of being sad for their loss, I am choosing to be inspired by how Lemmy and Bowie faced their ends. These men followed their creativity wherever it led them, and it led them into some enchanting places, and some very dark ones. And they were fearless. Neither of them faded away. They worked until the end, staying true to their creativity and fire. They were true artists, who breathed music until their last breath. I strive to be like these men, to create with truth while I’m alive, and to look death in the face and say, “Screw you, you won’t stop me.” If you are a creative being, to do any less is dying in your soul and leaving a carcass that pumps blood through a lifeless heart. FitCat Head Janiss Garza Speaking on Panel for PALA. FitCat is a boutique publishing and media company that specializes in highly niched print and digital books, and digital artwork. We work with authors, photographers and artists to help them find their audience.